Tell us how we can help you, download our Programs Menu and Corporate Brochure and get a tailored recommendation & quote the same day! A total commitment to quality, service, your people and you. 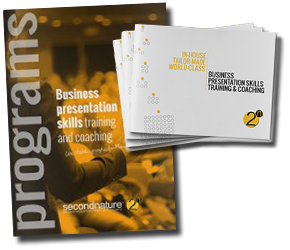 secondnature is an Executive Training Consultancy – the business presentation skills experts. We specialise in world-class, in-house, private training, coaching & consulting programmes.. What does this mean for you…we take people further!